Boxing Day football fixtures are a staple of the Christmas period in the UK, and something I miss heading out to here very much. We’ve talked about them before in our Christmas episodes of the AFTN podcast, with the likes of Robbo and David Edgar telling us how much they miss the buzz of a Boxing Day match themselves. Back in the day, when you only earned two points for a win and could use just one substitute, they even played matches on Christmas Day itself. The programmes produced for these Christmas matches have thrown up some fun stuff over the years and we’ll be bringing you some of that this month in our Festive Fun section (it’s not just puzzles you’re getting every day!). My team in Scotland, East Fife, played host to Motherwell in a Scottish top flight match on December 25th 1971. The programme for that game produced this little ditty. It wasn’t a Christmas number one! But another tune to add to the Christmas songs that have been turned into football chants, along with the likes of Jingle Bells and Away In A Manger. Can you do better? Could you do worse?! 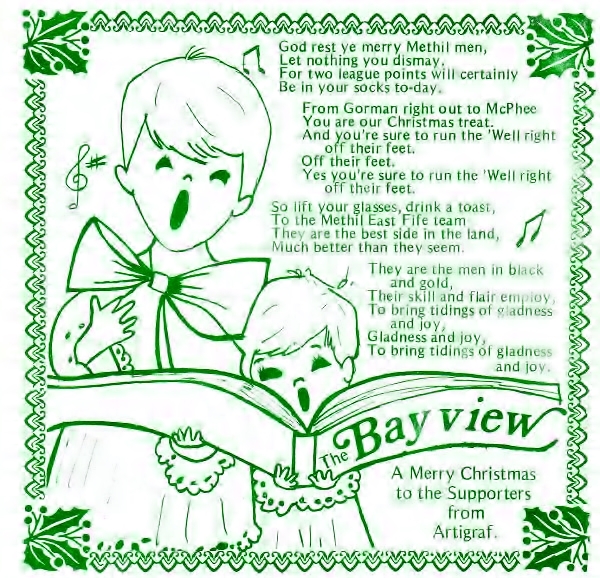 I know we have a few budding songwriters out there, coming up with some very innovative ‘Caps chants, so can you write a better Whitecaps related Christmas tune to a well known festive song (carol or otherwise)? Show us your best efforts in the comments below!